For Christmas I had booked Chris and me a Spa Day at Sprowston Manor, Norwich. The package included a pass for two into the Spa facilities; use of pool, steam room, sauna, whirlpool and gym. We then added on to this a treatment each. I purchased the Day Pass from Virgin Experience Days, priced at £24. 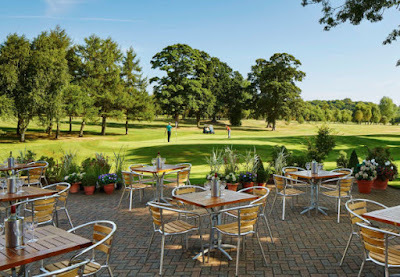 Sprowston Manor is part of the Marriott Hotel and County Club chain and is situated in picturesque grounds on Wroxham Road, Norwich. It is a grand 16th-century manor with stunning views across the Norfolk countryside. Boasting an 18 hole Golf Club, Spa facilities, restaurants and luxury contemporary accommodation, Sprowston Manor is an idyllic location for your weekend breaks, weddings, pamper days and conventions. Once I had received the voucher through the post I had to activate the voucher online, this was a very simple two step procedure which then took me through to the booking information. A quick phone call later and we were booked in. The phone call actually takes you through to a recorded message, where you simply leave your details and they call you back. I was called back within approximately 20 minutes and the lady I spoke to was very polite and extremely helpful. She booked us in for our Spa Day and I was able to add on the treatments at the same time. I booked us both in for 11am and she let me know that I was to pay upon arrival. On the day we arrived at 10.40am, this gave us time to check in, have a quick tour of the facilities and to get changed ready for our treatments. We had both chosen a back, neck and shoulder massage at £40 each. Once changed we headed into the waiting room, a comfortable room, slightly dimmed lights and tranquil music. In here there was fruit and green tea or cold water available and the forms to complete prior to your treatment. Just before 11am, the ladies arrived who would be carrying out our treatments and we were taken through to our respective treatment rooms. These were, as you would expect, set up in a similar tranquil manner; music and candles, dimmed lighting and the massage bed in the centre of the room. After a quick consultation, my lady left me to get settled on the treatment bed, a gentle tap on the door and she returned ready to start my massage. I had a lovely massage, the one I had booked lasted for 30 minutes. The only downside was the treatment room was situated along the corridor which lead to the swimming pool changing facilities, as the pool is also open to hotel guests it is popular with families, this itself wasn;t any issue to us but the excited kiddies could clearly be heard as they ran along to the changing room. After the treatments were finished, we were given a robe and slippers to use around the pool facilities and shown back through to the waiting room to enjoy a drink. Then we made our way through the changing rooms and out into the pool area. This is a bright and airy room, with a moderate sized pool in the centre, a jacuzzi bath in the far corner which is flanked by large windows on either side. Along the other side of the room you find the steam room and sauna. There is a small kiddies splash pool and plenty of loungers for those who wish to relax, perhaps to read a good book! We found two empty loungers to leave our robes by and headed over to the steam room. The pool wasn't overly busy despite it being a Saturday and there was no one on the steam room. The steam did wonders for helping to clear the sinuses, especially with the lingering remnants of a winter cold. From here we moved through to the sauna, again this was empty. Then it was time to get in the pool. After a swim we decided to chill in the jacuzzi bath, only we were disappointed to find that this was out of use. After making enquiries we found out that this had been an on going issue. I was a pity that we hadn't at least been told upon arrival, perhaps a sign up. They have now added a notice to their website. Hopefully this will be rectified soon. After another go in the steam room and sauna, then a swim through the pool we decided to head out for lunch. We did enjoy our treatments and time in the pool, a little disappointed about the jacuzzi bath and the noisy treatment room, would we go again? I think I might but not after trying elsewhere first.